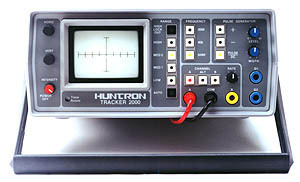 The Huntron Tracker 2000 was the longtime mainstay of the Huntron benchtop product line. Thousands of Tracker 2000s were sold over the years with the last ones being manufactured in late 2003. If you are considering the purchase of a Huntron Tracker, be sure to examine what your test needs require. Although the Tracker 2000 was a great product, the range selection capabilities of the Tracker 2000 were somewhat limited in that they are not well suited for lower voltage components used on today's typical electronic PCB. The LOW (10Vpk), MED1 (15Vpk), MED2 (20Vpk) and HIGH (60Vpk) ranges used voltages that were too high creating an issue where semiconductive signatures from these newer devices (usually surface mounted) were too narrow to make useful interpretations. This was caused by the horizontal voltage scale being too high (the LOW range voltage was 10Vpk making the horizontal scale 2.5V per division). This issue was remedied with the release of Trackers that used variable ranging such as the Tracker 2800 and Tracker 3200S. The Tracker 2000 was discontinued in 2003 but manuals for the Tracker 2000 and other older Huntron products are still available by ordering the Huntron Product Manuals CD, part number 06-5217. The CD is available for purchase at our Shop Huntron online store. By lowering the test voltages used in the newer Trackers such as the Tracker 2800, useful signatures can be obtained from low voltage devices. 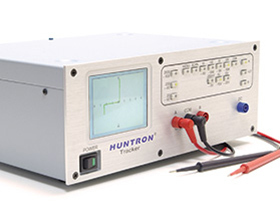 The Tracker 2800 has all of the updates you would expect from a modern day Huntron Tracker including variable ranging (voltage, source resistance and source frequency), LCD display with touch-screen controls and a DC Voltage Source for testing gated devices.